You’ve heard of wearing your heart on your sleeve? For former president and Navy veteran George H.W. Bush, it’s more like wearing your heart on your head. 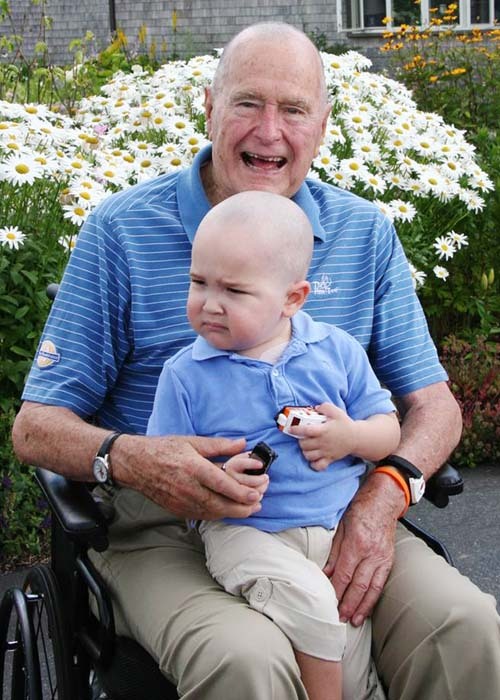 Bush, 89, shaved his head Wednesday to show support for a 2-year-old cancer patient named Patrick, the 41st president’s office announced. Patrick, whose last name was not released, is the son of a member of Bush’s Secret Service detail. Patrick was losing his hair because of treatment for leukemia, and other members of Bush’s security detail shaved their heads in solidarity. When the former president noticed the bald heads cropping up around him, he decided to go under the razor himself, according to multiple reports. USA Today reported that a website has been launched to assist with Patrick’s medical bills. (You can visit it here.) A benefit motorcycle run is planned as well, according to the site. Although Patrick has many years of treatment ahead of him, the little guy’s prognosis “is very positive,” the site says. President Bush and his wife, former first lady Barbara Bush, lost an infant daughter, Robin, to leukemia 60 years ago in October, USA Today reported.